A Lyndhurst Primary School student was grinning from ear to ear after she was named the winner of a national literary prize. 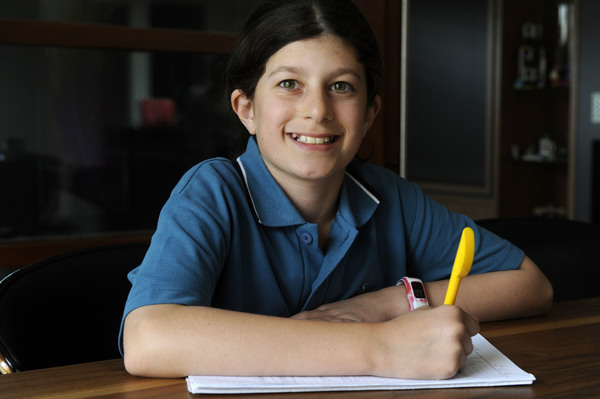 Grade 5 student Olivia says she couldn’t believe it when her teacher told her she had taken out the Oxford Australian Children’s Word of the Year Competition for her age group. “I really enjoy reading mystery books and I especially love stories that keep you guessing till the very end so I thought that it would be a good challenge to write my own mystery story,” Olivia said. The competition required students a piece of free writing up to 500 words which could be creative, factual, funny or serious. After countless hours reviewing hundreds of entries, Olivia’s spooky piece impressed the judges. “I couldn’t believe that out of all the entries they had chosen my story,” Olivia said. Mum Lyndal Argaet said she was proud of her daughter after watching her for weeks bring the story together. “She spent a lot of time editing the story to make sure she didn’t exceed the word limit. It was a wonderful surprise that she won and we’re all very proud of her achievement,” she said.